Save Outlook email messages in PDF format. Individually or in bulk. 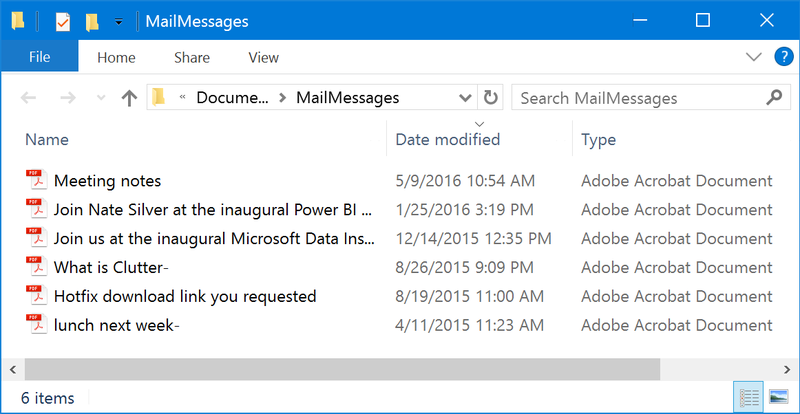 Outlook does not have a built-in "Save As PDF" feature. email messages in PDF format. Save messages one-at-a-time or on bulk. Save to a local hard drive, to a network share or to a sync cloud folder, such as Dropbox or One Drive. Works with your existing infrastructure. Auto-rename messages as they are saved, so you do not have to rename them one-by-one. Maintain consistent naming convention. Date Modified on saved files will be set to the original message timestamp. This is crucial to be able to easily locate messages later. Automatically save new messages using MessageSave Scheduler. After a one-time configuration, MessageSave will keep saving messages without requiring any user actions. "I am an attorney and have been searching for a long time to find a product that would allow me to easily save Outlook emails into client folders outside of Outlook. MessageSave does exactly what I need, and does it well. I am glad I found this product." - Brian T.
"I run a commercial real estate development and building company. We have many projects underway and need to store documents and e-mail in the correct locations for quick and easy later retrieval. The combination of MessageSave and QuickJump is an outstanding and easy-to-use way to store, find and manage our e-mail documents." - Robert E.
"We are a large International Engineering Consultancy. We have large amounts of emails required to be saved as date, time, from/to format. Currently we forward to document control and messages are saved individually and manually. This is time consuming and file folders are not up to date. Message safe does the job faster and easier in a format that complies with our Quality Management System." - Chris H.
"MessageSave a great product! It will help us archive our e-mail with each project, and keep it together with all that project's drawings, documents and other electronic files." - Rich M.
"Amazing. That's all there is to say! At our university, there is a need to document activities that occur on campus, and many of that comes through our e-mail system. This is the best way to keep track of what's going on, and I'm going to recommend it to at least 2 departments first thing in the morning!" - Morgan E.
If you just installed MessageSave and the messages are saved in MSG format, rather than PDF, please follow these steps. They only need to be performed once. The setting will be remembered for the future. Click "More>>" to see the expanded version of the MessageSave window. Select "PDF" in the "File Format" field.